form in a prescribed format to NIELIT Chandigarh as early as possible on first come first serve basis. There is no specific last date. This Faculty jobs in NIELIT is contract based only. Selection for this Sr/Jr Faculty jobs recruitment will be through written test and personal interview. If you are having sufficient technical skills then you can apply for this Faculty Positions. There are total 150 Senior and Junior Faculty Vacancies available in NIELIT offices all over India. 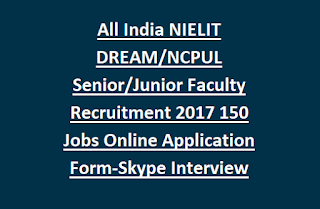 For more details regarding this NIELIT DREAM/NCPUL Senior/Junior Faculty Jobs recruitment 2017 see the below given details. Last Date for submission of application form is Not at given. Based on Resume details interview will be conducted through Skype. There is no specific last date for this vacancies. There are total 150 vacancies available in this recruitment of NIELIT DREAM/NCPUL Center. As on 01-July-2017 Lower age limit is 21 years and upper age limit is 48 years for these Faculty positions of NIELIT. For Senior Faculty-Candidate must have qualified MCA/ B.Tech ( CS/IT)/ MSc. (CS/IT)/ NIELIT ‘A’ Level/ PGDCA/ BCA with 2 Years Post Qualification experience. For CABA Centers Application fee Rs.350/- to be paid through NEFT to the NIELIT Chandigarh account. For DREAM Centers Application fee is Rs.500/-. Selection for Faculty recruitment in NIELIT will be through written test and personal interview. Online interview shall be conducted by Skype. Interested and willing candidates can submit their application form to NIELIT Chandigarh as early as possible along with all required documents and Fee payment receipt. 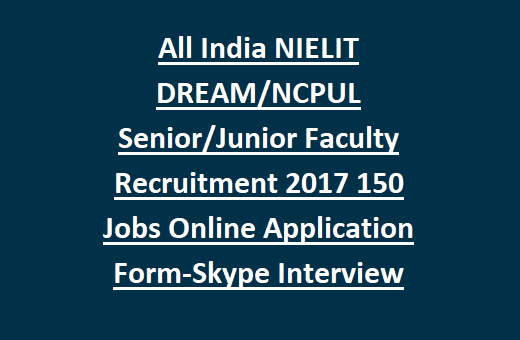 Download Application form for DREAM Faculty Jobs of NIELIT. Download Application for NCPUL CABA Faculty Jobs Recruitment of NIELIT.